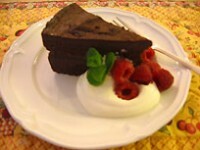 This rich, dense chocolate cake was a favorite many years ago in the Bay area. I believe it was first served at Narsai’s in Kensington and can be found in Alice Medrich’s wonderful book called, COCOLAT. It can be made ahead and kept in the fridge or the freezer. I like to serve it in wedges with a dollop of whipped cream and fresh raspberries. 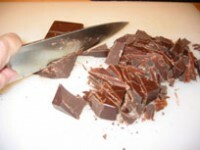 To melt the chocolate, put the chocolate with the butter in the top of a double boiler over gently simmering water. Let cool. 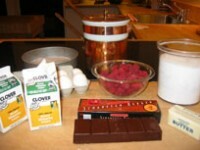 To make the cake, put the eggs and the sugar in the bowl of an electric mixer and beat with the whip for 5 minutes. Carefully fold in the chocolate mixture with the flour. Pour the mixture into a 9-inch springform pan that has been lined with parchment. Put it into a larger pan of water and bake 15 minutes in a preheated 400 degree oven. Cool on a rack, unmold, and chill. To make whipped cream, put the cream in a bowl and whisk until soft. Stir in sugar to taste. You can either frost the cake with the whipped cream, decorating it with rosettes, or cut the cake into wedges and serve with whipped cream and fresh raspberries on the side.